Free Printable Cashier Resume Template. Free Printable Cashier Resume template that you can fill with your own information. 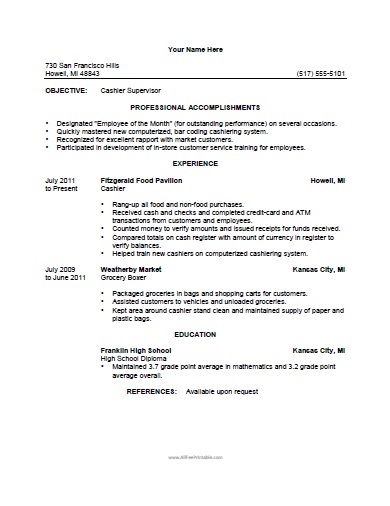 You can use this sample Cashier Resume Template to get ideas when preparing your resume. Complete with your contact information, objective, accomplishments, experience, education and references if required. Print the Cashier Resume Template using your inkjet or laser printer and go find a new cashier position at a supermarket, grocery store or department store. The Cashier Resume Template is in word format to help you personalize the way you want it. Click the link below to download the Cashier Curriculum Vitae Template in MS Word format. Instructions: Click the link to download the MS DOC file, personalize, customize and print.